A Techie in CHRIST: Moto G is here! the cracked screen replacement and other reasons why it matters. Moto G is here! the cracked screen replacement and other reasons why it matters. So to day I was surprised because I totally forgot about the moto g announcement. I know its just a cheap version of the moto x but I think there is much more to the story. The moto G to me is googles attempt to disrupt the industry! I know TMobile has been championing that sentiment for a while now but google seems to be doing it more effectively , maybe they should team up. The moto G has a 4.5 720 p screen, 1 gig of ram, a quad core processor, fm radio, almost pure android, and a guarantee to have kit kat running by january. Ok I know the specs is nothing to write home about but its better than the typical Virgin mobile phone at that price, oh yeah i forgot to mention price ,,,,,,,$179 UNLOCKED!!! Are you kidding me! That is the catch. When I heard the price I instantly made a post about it. The thing that separates this from the other phones in that range is that the older phones that drop to similar prices usually are forgotten by the carriers. You may can get an old unlocked iphone 3g but it wont have ios7 or app store support. 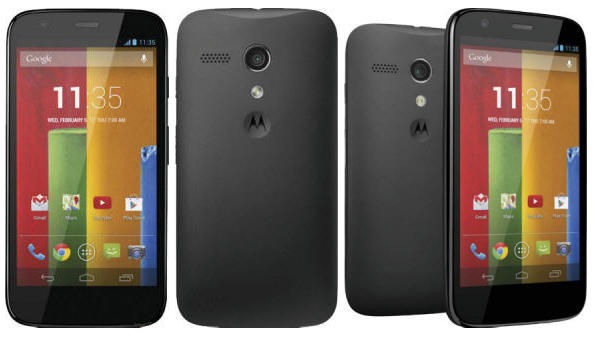 This phone does have google play store support and it will be updated by google I mean Motorola itself. I was happy with this phone because at the least it will be the new cracked screen replacement. Usually the cracked screen will set you back $150 , why not just get a new phone. I once dropped my iphone in the toilet, before knowing the rice trick , and pondered paying $400 for a replacement. Not now, loose your phone , get moto g, phone gets flooded, get a moto g. Its a cheap phone that you can be happy to have! So google is trying to disrupt the subsidies in America with first the $349 Nexus 5 and now the $179 Moto G. I feel this a great strive in trying to break through artificial value they place in phones just because it has a cell radio. I no longer have to keep renewing the obviously overpriced cell contracts so I can get a phone actually worth using without the sticker price. Sometimes Capitalism works perfectly, competition and competitiveness is a win for us customers!